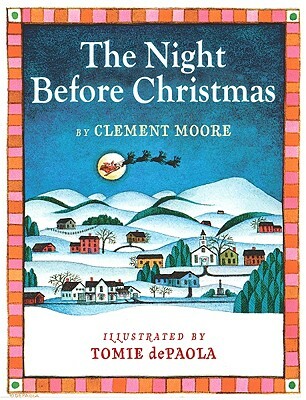 The perfect stocking-stuffer edition of a classic Christmas tale, from the creator of Strega Nona, Quiet, and many more. Award-winning artist Tomie dePaola brings the beloved holiday poem to life, depicting a New England family in turn of the 19th century America, lovingly tucked up in cozy quilts as Santa arrives. Portraits of ancestors hang by the fire as Santa leaves toy trumpets, dolls, and toy soldiers for the children before taking off over the snow-capped hills with his eight reindeer. Cozy illustrations of a red-cheeked St. Nicholas are framed by borders inspired by traditional New England quilts. A family holiday favorite since its original publication in 1980, this board book edition is perfect read-aloud for snowy nights. Tomie dePaola's many beloved books have enchanted generations of children around the world. His numerous awards include a Caldecott Honor Award, a Newbery Honor Award and a New Hampshire Governor's Arts Award of Living Treasure. He lives in New Hampshire. Clement Moore (1779 - 1863) was a professor of classics at General Theological Seminary in New York. He wrote The Night Before Christmas for his children in 1822.